This is a 10 slide powerpoint that introduces the concepts of continental drift and plate tectonics. It includes colorful pictures, powerpoint animations and a link to an online animation of global plate reconstructions. 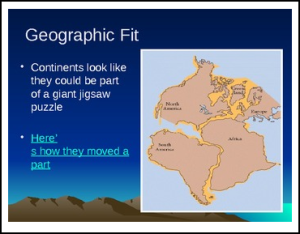 This powerpoint is meant to be a “starting point” for introducing the topic of continental drift and plate tectonics and gives you a base from which to delve deeper into the topic with your students. I am offering it free here on Teachers Pay Teachers so that you can see the quality of my work and at the same time, get something that you can use today in your classroom.